Prior to 2004, a vacant stretch of asphalt created an unsightly and dangerous landscape at the intersection of East Moyamensing Ave., Second & Christians Sts., in historic Queen Village, Philadelphia. It was that year that local politicians and hard working volunteers transformed the space into a beautiful little park featuring brick sidewalks, wrought iron fencing and hearty plantings. Despite all good intentions, the lack of a long-term maintenance strategy soon resulted in the area falling into disrepair. Weeds and litter accumulated, light bulbs burnt out and overall, the park was in sad shape. This changed in October of 2005 when a small group of neighbors took it upon themselves to make an investment in their community. 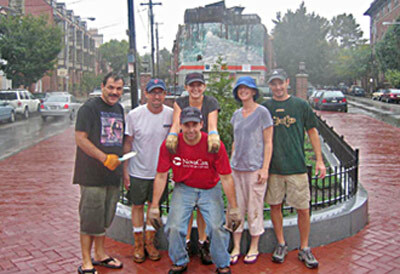 It began with six individuals simply planting flowers, replacing light bulbs and cleaning trash and over the years has resulted in the addition of benches, trees and a resilient rosebush. The group, now consisting of more than a dozen members, maintains The Point regularly through watering, seasonal plantings and general upkeep. We invite you to join us as we continue to enhance Moyamensing Point and make it a beautiful gathering spot for neighbors to enjoy. Please feel free to come out to one our events, all ages are welcome, or send us an email for more information.